The true nature of what actually crashed in Roswell, New Mexico, in 1947 remains classified. Only a select few have ever had access to the truth about what became known as Area 51. But what happened to the remnants of that crash is shrouded in even greater mystery. What began in the high desert of New Mexico ended at Wright-Patterson, an ultra-top-secret Air Force base in Dayton, Ohio. The physical evidence of extraterrestrial visitation was buried deep within this nuclear stronghold. How tragic that such seismic news should be kept from the people of the world . . . pieces of history, now quickly dwindling into oblivion as the last of the secret-keepers passes on. In addition to its rich history of military service to our nation, Wright-Patterson also stands as the secret tomb of one of the greatest occurrences in recorded history. Be prepared . . . the real Area 51�Wright-Patterson�s vault�is about to be opened. 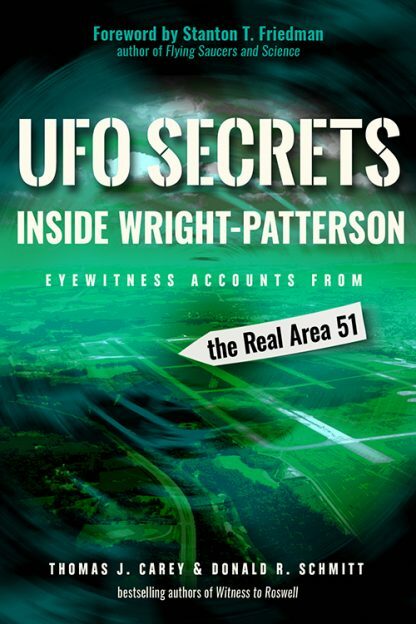 Newly discovered Project Blue Book files from Wright-Patterson including photos and Air Force investigations of UFOs.